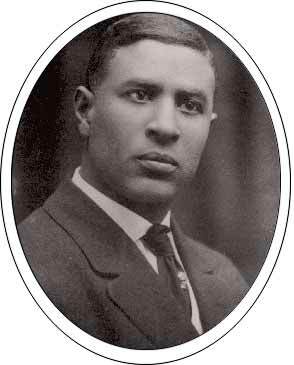 Garrett Augustus Morgan was an African American businessman and prolific inventor of devices that made people's lives safer and more convenient. 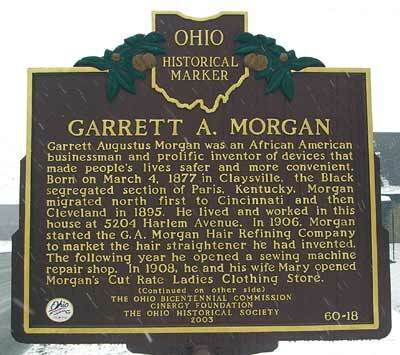 Born on March 4, 1877 in Claysville, the Black segregated section of Paris, Kentucky, Morgan migrated north first to Cincinnati and then Cleveland in 1895. He lived and worked in this house at 5204 Harlem Avenue. In 1906, Morgan started the G.A. 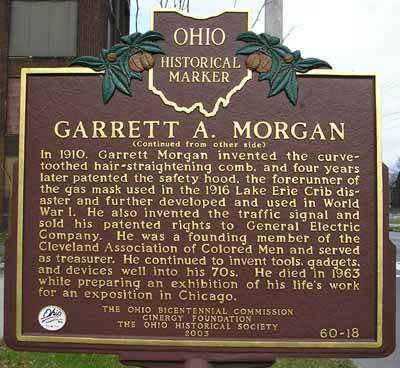 Morgan Hair Refining Company to market the hair straightener he had invented. The following year he opened a sewing machine repair shop. In 1908, he and his wife Mary opened Morgan's Cut Rate Ladies Clothing Store. In 1910, Garrett Morgan invented the curve-toothed hair-straightening comb, and four years later patented the safety hood, the forerunner of the gas mask used in the 1916 Lake Erie Crib disaster and further developed and used in World War I. He also invented the traffic signal and sold his patented rights to General Electric Company. He was a founding member of the Cleveland Association of Colored Men and served as treasurer. He continued to invent tools, gadgets, and devices well into his 70s. He died in 1963 while preparing an exhibition of his life's work for an exposition in Chicago.